valve is installed to bleed off pressure at 341 psi. Another relief valve operates at 357 psi for rapid release of excess pressure. There is also a frangible disk designed to burst at 600 psi should the relief valves fail to control pressure buildups. There are advantages and disadvantages to each type of carbon dioxide system. Low-pressure storage units have a liquid level gauge that continuously monitors the amount of carbon dioxide in storage. High-pressure systems require weighing the cylinders. High-pressure systems permit storage of almost the exact amount of carbon dioxide required to protect a hazard area because of the flexibility and selection of cylinders in 50-, 75-, or 100-pound sizes. The smallest low pressure is 750 pounds. High-pressure systems require refilling and hydrostatic testing every 12 years. Low-pressure systems have no such requirement. Pressures in high-pressure systems vary with the ambient temperature; this affects the discharge rate of the system. Low-pressure systems keep the liquid carbon dioxide at 0F and 300 psi at all times, assuring a uniform discharge rate. 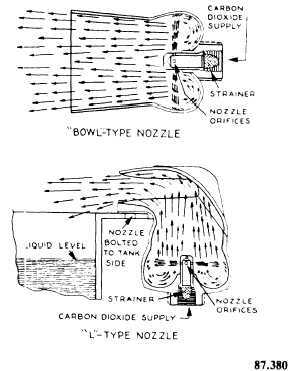 Another advantage of low-pressure systems is their ability to allow automatic, simultaneous discharge for more than one hazard area on an engineered basis. Hose reels can also be attached to these systems to operate simultaneously with hazard protection. A reserve supply can be provided by increasing the storage unit size of low-pressure systems. High-pressure systems require manifolding and valving arrangements to achieve a reserve supply. Storage of the carbon dioxide is also a consideration in showing advantages or disadvantages of these systems. High-pressure systems require approximately 3 pounds of equipment for every pound. Usually, low-pressure systems require less floor space for storage of equal amounts of carbon dioxide as compared with high-pressure systems. In many instances, low-pressure storage containers may be placed outside of the buildings. High-pressure systems allow flexibility in space requirements since multiple cylinder banks may be stored in several smaller locations. Low-pressure systems require one large, single area for the refrigerated storage unit. As with all fire protection systems, carbon dioxide systems must have operating devices for discharge of the extinguishing agent and to cause alarms to be actuated. Many of the operating devices discussed earlier in this chapter can be used. Most commonly used are the heat-actuated devices (H. A. D.) or smoke detecting devices. Manual controlling devices are also used in carbon dioxide systems. Whether the agent release is automatic or manual, an alarm at the alarm system control unit should be actuated. Carbon dioxide fire protection system pipe and fittings are selected to have suitable low temperature characteristics and good corrosion resistance inside and out. Ferrous metals are galvanized steel, copper, brass, and other materials having similar mechanical and physical properties are acceptable. Copper tubing with suitable flared or brazed connections is also acceptable. Cast-iron (gray) pipe and fittings are not used. Pipe and fittings for high-pressure systems have a minimum bursting pressure of 5,000 psi. In low-pressure systems, pipe and fittings have a minimum bursting pressure of 1,800 psi. Between the storage tank and selector valves, black steel pipe may be used because of the larger sizes involved and its airtightness. Figure 8-32. - Carbon dioxide nozzles.